The Core is Getting Soft.6: Ohm…Ohm….Ohm…. While the last post in this series on plug ins and virtual instruments, “Tuba Time,” proved that there are some truly atrocious digital products out there, this should not cause one to give up hope. 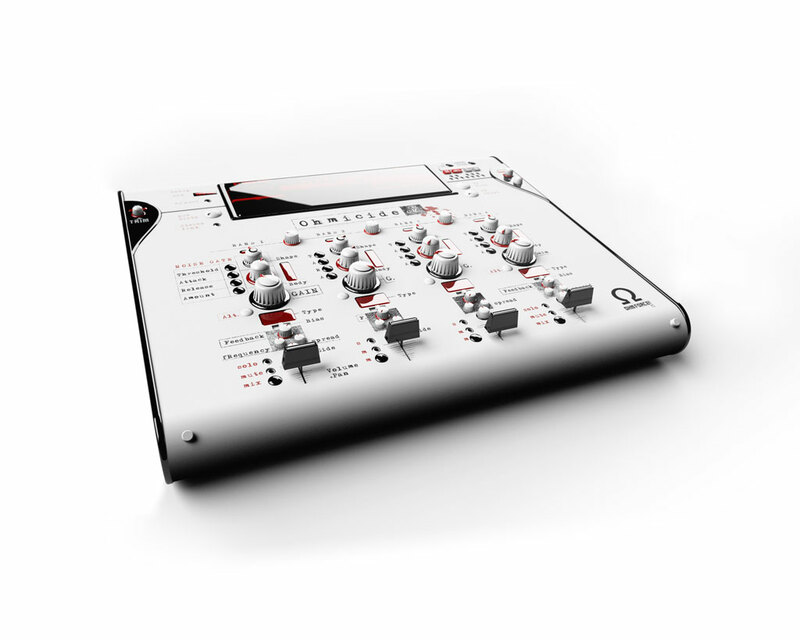 One of the best software developers out there, the French company Ohm Force, make fantastic products, and they are on sale through July 15th at a reduced price. Like the UBK-1 reviewed earlier in this series, these plug-ins stand out from the crowd by using digital technology to do something new and creative, rather than emulate classic analogue recording equipment, like the Ampex tape machine I reviewed at the start of this series. The tools these fried French make fall into recognizable categories. (The above pictured Ohmicide is a distortion plug in, the Ohm Boyz is a delay, the Symptohm Melohman is a synth, Quad Frohmage is a filter, etc. The Hematohm, which I love, is billed as a “frequency shifter,” which is not a genre of effect I’m familiar with, but perhaps you are.) But they take those genres as points of departure rather than final destinations. These plug-ins are all really more like synthesizers than effect pedals, as the range of sounds you can get using their complex controls is pretty vast. They also all come with a huge number of presets that have confusing names. You have to be really willing to take the time to get to know these effects, which is one of the things I like the best about them. Digital technology often dumbs down the process of making music. While I’m not really a fan of the Ohm Force aesthetic in terms of the demos they do with their stuff and the visual design of their “custom look,” (see below – you can choose trad designs or stuff like this for each piece,) the thought and innovation that went into these tools is readily apparent. The fact that they ask you to put the time and effort in to use them well seems only fitting in that light. Their original synthesizer (Symptohm Melohman, pictured above) is also interesting because it departs from the retro trend in virtual software synths not just in design but also in sound and feel. The adjectives “warm” “(p)fat” etc. are repeated ad nauseum among fans of synths. I read a review of this instrument that rightly pointed out that it makes a conscious effort to sound – COLD! There’s something clinically precise and unforgiving about its sound that contrasts really well with the vintage synth emulations that are so popular. They sound quite nice together. I got a bundle of their stuff at a big discount cuz I went back to school last year and took advantage of a generous student discount. But even if you are a layman as I will be in a few weeks, you can get excellent rates now if you register on their website. 05 Jul	This entry was published on July 5, 2013 at 6:56 pm. It’s filed under Music, Series of posts, The Core is Getting Soft and tagged Digital vs. Analog, Music, Plug Ins, software reviews, The Core is Getting Soft. Bookmark the permalink. Follow any comments here with the RSS feed for this post.